Remember to provide"the historical background of the site (including history of previous archaeological excavations, if any), objectives of the current excavation, progress at the site, and significance of discoveries to biblical study. "Make sure to choose a good encyclopedia, journal articles, and books that specialize in the subject. This will give you a cross section of material. You may find more information under Eilat Mazar who is the director of the dig for the Excavations at the City of David. Bolen, Todd. “Identifying King David’s Palace: Mazar’s Flawed Reading of the Biblical Text,” Bibleplaces.com (September 2010): n.p. LINK. Eisenbud, Daniel K. “Archeological find in Jerusalem's City of David may answer ancient mystery,” The Jerusalem Post (November 2015). Faust, Avraham. “Did Eilat Mazar Find David’s Palace?,” Biblical Archaeology Review 38, no. 5 (2012): 47–52, 70. This article is LINK. Hazony, David. “ 'Find of the century’ may be King David’s palace,” Canadian Jewish News (Don Mills, Ont, 2005): 11. _____. 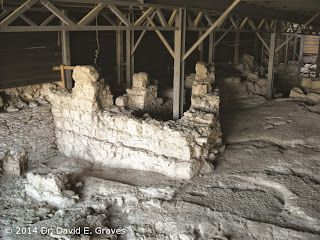 Discovering the Solomonic Wall in Jerusalem: A Remarkable Archaeological Adventure. Jerusalem: Shoham Academic Research and Publication, 2011. _____. “Did I Find King David’s Palace?,” Biblical Archaeology Review 32:1 (January/February 2006): 16. LINK . _____. The Complete Guide to the Temple Mount Excavations. Jerusalem, Israel: Shahom Academic Research and Publication, 2002. _____. Preliminary Report on The City of David Excavations 2005 at the Visitors Center Area. Jerusalem, Israel: Shalem Press, 2008. _____. The Palace of King David Excavations at the Summit of the City of David: Preliminary Report of Seasons 2005–2007. Jerusalem, Israel: Shoham Academic Research and Publication, 2009.